Background: Weight loss is the cornerstone of NAFLD management, but weight maintenance is difficult. Some studies have suggested that n-3 polyunsaturated fatty acid (n-3 PUFA) might have beneficial effects in NAFLD. We aim to compare the effects of a low-energy diet with n-3 PUFA supplementation on liver enzymes, body composition, and cardiometabolic risk factors in NAFLD. Materials and Methods: The study was a randomized controlled trial conducted in Urmia in Iran from October 2016 to May 2017. One hundred and fourteen eligible patients were randomly assigned to one of the three following groups: low-energy diet group, n-3 PUFA supplementation (fish oil) group (1500 mg/d), or control group for 12 weeks. Liver enzymes, lipid profile, insulin resistance, and body composition were assessed before and after the intervention. Results: One hundred and four patients completed the study. All groups lost weight, but the reductions were greater in the diet group (−2.97 ± 2.79 kg, P = 0.001). The diet group had significant decreases in fat mass compared to other groups. Insulin resistance, total cholesterol, and low-density lipoprotein cholesterol significantly decreased only in the diet group, and patients who lost weight ≥4% showed significantly larger decreases in serum liver enzymes. N-3 PUFA had no beneficial effects on the study outcomes. Conclusion: We found that 1500 mg/d n-3 PUFA supplied for 12 weeks, in contrast to 3.40 ± 2.98% weight loss, does not improve liver enzymes, body composition, and cardiometabolic risk factors in NAFLD patients. Nonalcoholic fatty liver disease (NAFLD) is emerging as the most common chronic liver disease worldwide, affecting an estimated 25% of the global adult population. It encompasses a spectrum of liver damage ranging from simple steatosis to nonalcoholic steatohepatitis, potentially leading to advanced fibrosis and cirrhosis. Previous studies have supported that NAFLD is strongly associated with insulin resistance, obesity, and dyslipidemia. Furthermore, patients with NAFLD have an increased risk of atherosclerosis and cardiovascular disease (CVD) which is the most common cause of death in individuals with NAFLD partly because many metabolic and inflammatory risk factors of CVD are affected by NAFLD. At present, there is no approved pharmacologic therapy for NAFLD. According to the current guideline, lifestyle modifications targeted at weight loss through dietary intervention and exercise remain the first-line therapy; however, previous studies have indicated that long-term weight control is difficult for the majority of patients. Therefore, it would be helpful if a safe dietary supplement would have comparable beneficial effects as weight loss. N-3 polyunsaturated fatty acids (N-3 PUFAs), especially eicosapentaenoic acid (EPA) and docosahexaenoic acid (DHA), are known to improve hypertriglyceridemia and reduce CVD risk. Lipidomic studies have demonstrated a significant association between a high hepatic N-6:N-3 ratio with the severity of NAFLD, consistent with low dietary n-3 PUFA intakes. Some studies have suggested that n-3 PUFAs can reduce steatosis and improve liver enzymes and metabolic parameters., In rodents, additional effects of n-3 PUFAs on reducing adiposity have been also reported, although results in human are controversial. In this study, we aimed to assess the effects of a low-energy diet or n-3 PUFA supplementation compared to control on liver enzymes, lipid profile, insulin resistance, and body composition in overweight and obese patients with NAFLD, because previous studies have not compared potential effects of diet therapy and n-3 PUFA supplementation separately. This study was a parallel randomized controlled trial. Patients were recruited from the Gastroenterology Clinic of the Urmia Imam Khomeini University Hospital in the Northwest of Iran, between October 2016 and May 2017. The diagnosis of NAFLD was established on the basis of the presence of steatosis via ultrasonography and was performed by a single operator. To be eligible, participants (aged 18–65 years) were required to have body mass index (BMI) between 25 and 40 and no evidence of other liver diseases. Patients with alcohol consumption, pregnancy and lactation, the use of medications known to cause steatosis, n-3 PUFA supplements and insulin sensitizers during 3 months before the study, involvement in a weight loss program, taking weight-loss medications, diabetes mellitus, untreated hypothyroidism, Wilson disease, hemochromatosis, substance abuse, and neoplasm were excluded from the study. The sample size was calculated on the basis of a study by Promrat et al. to detect a significant change in serum alanine aminotransferase (ALT) concentration between groups using a two-sided test with α =0.05 and power = 0.9. The sample size was calculated from 38 participants in each group using the following formulas n = (Z1-α/2+ Z1-β)2 (S12 + S22)/(μ1-μ2)2 and n' = n√k-1 (k: number of group). The study protocol was approved by the Ethics Committee of Urmia University of Medical Sciences and also registered in Iranian Registry of Clinical Trials (IRCT2016082429508N1). Written informed consent was obtained from all the participants. A total of 114 eligible patients were randomly assigned to one of the three following groups: low-energy diet group (n = 38), n-3 PUFA group (n = 38), or control group (n = 38) [Figure 1]. Randomization occurred by computer-generated random number list in blocks of six individuals, stratified according to BMI (25 ≤ BMI < 30, 30 ≤ BMI < 35, and 35 ≤ BMI ≤ 40). In the diet group, patients received individual instructions for a diet that was 350–700 kcal/d less than daily energy need Total energy expenditure was calculated using the Mifflin St. Jeor equation and activity factor of 1.3, because low physical activity was reported by all participants. The diet plan contained 30% of energy as fat, 52% as carbohydrate, and 18% as protein. Patients were instructed an exchange list, and an individualized 7-day menu was provided for each participant. Adherence to the prescribed energy was calculated according to a study by Warziski. The second group ingested an oral dose of 2500 mg/d fish oil concentrate (capsule) containing 850 mg EPA and 650 mg DHA in 2 divided dosages daily with a meal (Omegazon™, HealthAid). We selected the dose of supplement on the basis of a study by Qin et al. Compliance with the supplement was evaluated by counting returned capsules every 4 weeks. Participants in the control group received no intervention and placebo. 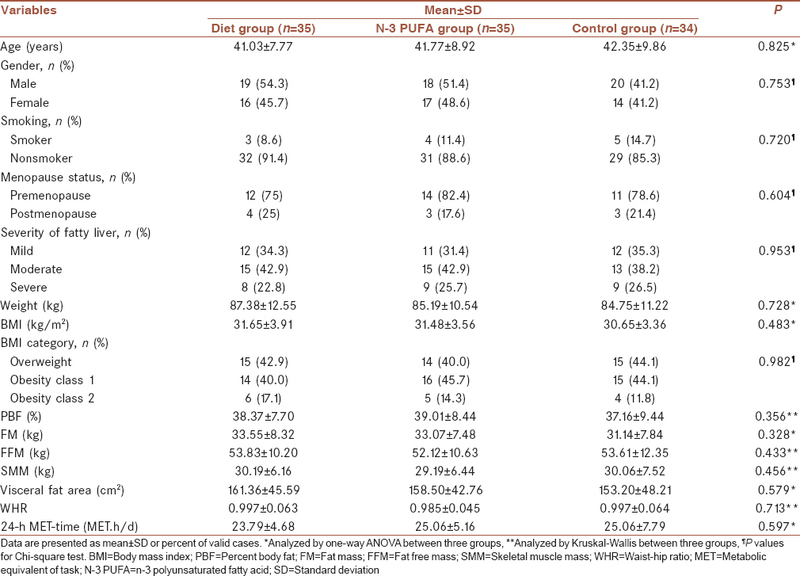 Participants in n-3 PUFA and control groups did not receive diet therapy and consumed their habitual diet. HOMA-IR: (fasting insulin [mU/mL] × fasting blood glucose [mg/dL])/405. Dietary intakes were assessed using 3-day 24-h dietary recall and a validated semi-quantitative food frequency questionnaire (168 items) at the baseline and the end of the study and were analyzed using Nutritionist IV software (First Databank, San Bruno, CA, USA). Physical activity level was evaluated using a validated metabolic equivalent of task questionnaire. Statistical analysis was conducted using SPSS statistical software version 16.0 (Chicago, IL, USA). Distribution of data related to normality was checked using Kolmogorov–Smirnov test. Continuous variables were compared among the three groups by one-way ANOVA with Tukey's post hoc test for normal distribution or Kruskal–Wallis test for nonnormal distribution. The within-group comparison was analyzed using the paired t-test or Wilcoxon test. The Chi-square test or the Fisher's exact test was applied for categorical variables. P < 0.05 was considered statistically significant. Associations between variables were evaluated using Pearson's correlation coefficients. A total of 104 participants completed the study. The baseline characteristics of the participants are shown in [Table 1] and [Table 2]. All groups were comparable at baseline in terms of demographic data, laboratory tests, and anthropometric measurements. Compliance with the supplement was 88.93 ± 7.45%. A total of 18 participants (51.4%) were adherent to the administered energy in the diet group. Four (11.4%) and 13 (37.1%) participants consumed less energy and more energy than amount prescribed, respectively. The reasons for attrition in each group are shown in [Figure 1]. All groups lost weight, but the reductions were greater in the diet group (P = 0.001). The mean weight loss from baseline was 2.97 ± 2.79 kg for the diet group, 1.16 ± 1.85 kg for the n-3 PUFA group, and 1.01 ± 1.43 kg for the control group. The mean percent weight loss from baseline was −3.40 ± 2.98% for the low-energy diet, −1.36 ± 2.19% for the n-3 PUFA group, and −1.21 ± 1.63% for the control group (P = 0.002). Similarly, all groups had significant decreases in BMI, fat mass, waist-hip ratio, and visceral fat area, but the reductions were greater in the diet group [Table 3] and [Table 4]. Significant correlations were found between decrease in fat mass and reductions in both AST and GGT (r = 0.549, P = 0.001 and r = 0.388, P = 0.021, respectively). Percent of weight reduction correlated significantly with improvement in insulin level (r = 0.362, P = 0.038). There was no significant difference in the mean of weight loss among participants in the diet group who were overweight at baseline and Class 1 or Class 2 obesity (data are not shown). In the diet group, a reduction in serum AST and ALT compared to baseline was observed, although the latter did not reach significance (P = 0.064). GGT level decreased from baseline within three groups. The magnitudes of change for serum ALT, AST, and GGT were not significantly different across the study groups, although ALT level trended toward a larger decrease in the diet group (P = 0.082). We explored relationships between tertiles of percent weight loss from baseline and changes in biochemical parameters according to the following categories: lost <2% or weight gain (Tertile 1), 2 ≤ lost < 4% (Tertile 2), and lost ≥4% (Tertile 3) in the diet group. We found that lost ≥4% was significantly associated with larger decreases in serum ALT, AST, and GGT but not in other biochemical parameters. A significant reduction in fasting blood glucose compared to baseline was observed in the diet group (from 82.31 ± 10.72 to 77.46 ± 9.04 mg/dL, P = 0.022), although differences were not significant across groups (P = 0.167). 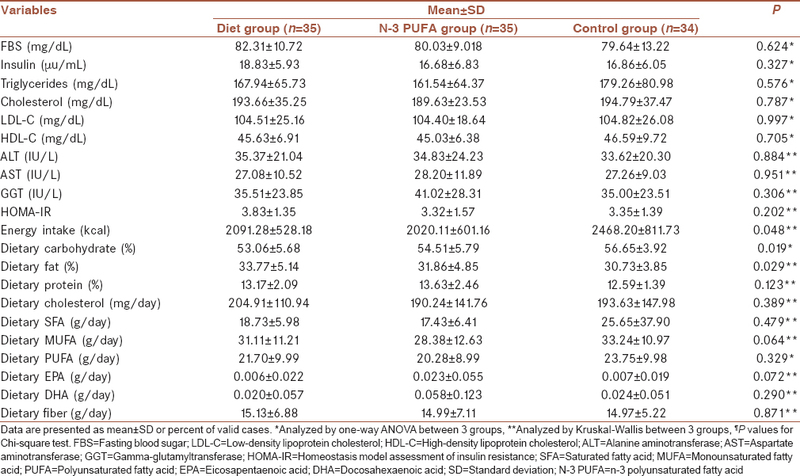 There was also a significant reduction in fasting insulin level only in the diet group (from 18.53 ± 5.75 to 12.86 ± 5.38 μu/mL, P = 0.001) which was significantly greater than that in the n-3 PUFA or control group. HOMA-IR value significantly decreased only within the diet group (from 3.77 ± 1.33 to 2.48 ± 1.13, P = 0.001), and differences from baseline were statistically significant between three groups (P = 0.005). Serum triglycerides did not change significantly within groups, although there was a trend toward an improvement in serum triglycerides in the diet group (from 167.03 ± 66.49 to 151.06 ± 68.16 mg/dL, P = 0.061). Significant decreases were found in serum TC, LDL-C, and HDL-C within the diet group. 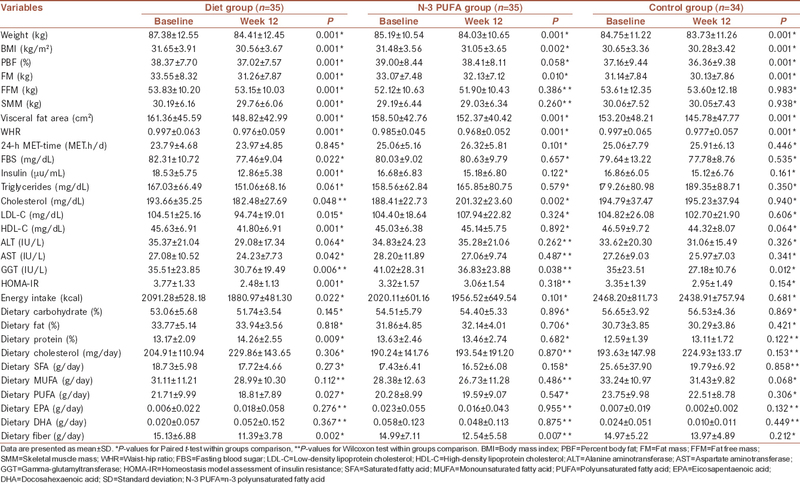 The differences were statistically significant compared with those in the n-3 PUFA group but not in the control group. Serum TC had an increase within the n-3 PUFA group (from 188.41 ± 22.73 to 201.32 ± 23.60 mg/dL, P = 0.002) which was not statistically significant when compared with the control group. Mean total energy intake significantly decreased from baseline only within the low-energy diet group (from 2091.28 ± 528.18 to 1880.97 ± 481.30 kcal, P = 0.022). 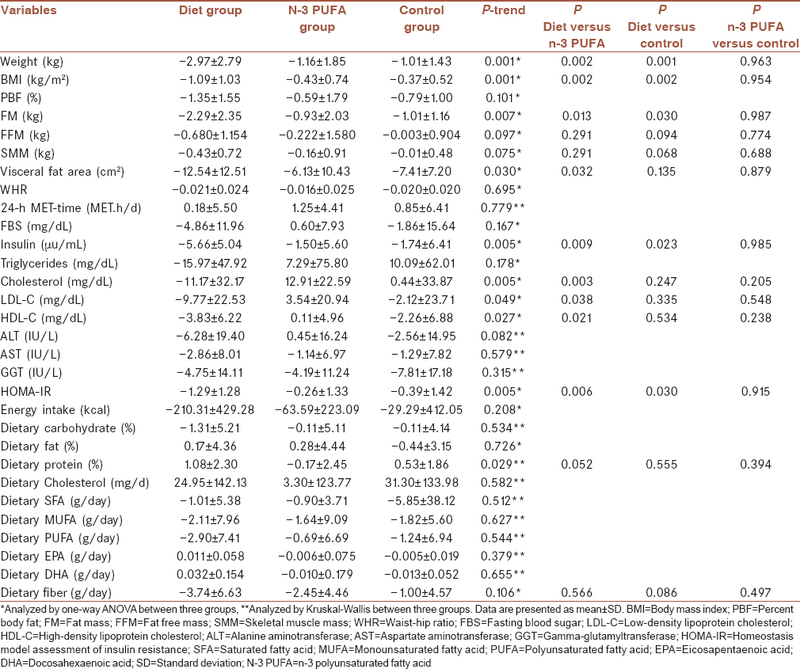 Dietary protein intake significantly increased from 13.17 ± 2.09% to 14.26 ± 2.55% in the low-energy diet group (P = 0.009), and the difference was statistically significant compared with the n-3 PUFA and the control group [Table 3] and [Table 4]. During the study, there was little change in usage of medications and there were no significant differences between groups. No difference in the physical activity level of participants was seen at the beginning and the end of the trial in the three groups. No adverse events were reported during the study. The results of the present study showed that 1500 mg/d EPA + DHA supplemented for 12 weeks, in contrast to moderate weight loss, did not improve serum concentrations of liver enzymes, lipid profile, insulin sensitivity, and body composition in overweight and obese patients with NAFLD. In the last decade, there has been growing interest in the role of n-3 PUFA as a potential treatment for NAFLD. These fatty acids have been shown to modulate hepatic lipid metabolism transcription factors such as peroxisome proliferator-activated receptor-alpha and sterol regulatory element-binding protein 1, which favor fatty acid oxidation and inhibit lipogenesis; N-3 PUFAs possess potent anti-inflammatory and antiatherogenic properties and improve lipoprotein and insulin metabolism. In addition, some studies in rodents and human have suggested that EPA and DHA supplementation might reduce obesity and favorably alter body composition. In the present study, n-3 PUFA supplementation provided no beneficial effects on the study outcomes. Our results are in agreement with a meta-analysis in 2012 by Parker et al. who concluded that n-3 PUFA supplementation might decrease liver fat and improve serum AST but not ALT, though the significance of the benefit in AST disappeared when only randomized controlled trials were considered. Recently, two studies also failed to detect any beneficial effects of prolonged n-3 PUFA supplementation on liver enzymes, lipid profile, and insulin sensitivity in patients with NAFLD., Conversely, in a study comparable to our trial in 2015, Qin et al. reported that 4 g/d fish oil supplementation (1250 mg EPA + DHA) for 3 months could improve serum ALT and GGT and decrease FBS, TC, and TG but not insulin level and HOMA-IR in an Asian population with NAFLD. In addition, results from a meta-analysis of 10 RCTs in 2016 have shown that n-3 PUFA improved liver fat, GGT, TG, and HDL-C. More recently, a new meta-analysis of 10 case–control studies and 11 RCTs has reported that blood or liver DHA content was significantly lower in patients with NAFLD compared to healthy controls, and n-3 PUFA supplementation significantly reduced ALT, AST, and TG and marginally reduced the liver fat content but not FBS. In subgroup analysis, the pooled effects showed that n-3 PUFA significantly reduced serum ALT and AST in trials with Jadad score <4. Unlike previous studies, we observed an increase in serum TC from baseline within the n-3 PUFA group. The reason for this observation is not entirely clear but may be in part related to a significant decrease in dietary fiber intake in this group. In our study, we found that −3.4% weight loss resulted in an improvements in ALT (marginal), TC, LDL-C, insulin, and HOMA-IR in the diet group compared to the n-3 PUFA or control group. After determining tertiles of percent weight loss, we found that patients who lost ≥4% of weight showed significantly larger decreases in serum ALT, AST, and GGT levels. Vilar-Gomez et al. reported an improvement in histologic outcomes following 52 weeks of lifestyle modification. Overall weight loss was 3.8 ± 2.7%. They found that weight loss ≥5% was associated with the level of improvement in histologic features, liver enzymes, FBS, HOMA-IR, and serum cholesterol. Okita et al. reported a mean weight loss of 1.6 ± 0.5 kg at week 8 and 2.4 ± 0.9 kg at week 24 following an energy-restricted diet in 14 patients with NAFLD. An improvement in ALT and AST compared to control was observed; however, the effect of weight loss on metabolic risk factors was not reported. Likewise, Thomas et al. reported that a mean weight loss of 4% following an energy-restricted diet for 24 weeks resulted in an improvement in hepatic fat, HbA1c, and AST with a marginal effect on ALT. In the present study, a significant reduction in serum HDL-C was observed in the diet group. This finding is in line with results from a meta-analysis indicated that the effect of weight loss through dieting on HDL-C is different in active and stable weight loss periods. HDL-C decreased during the active weight loss period; however, when weight stabilized at a reduced level, HDL-C increased. Given the impracticality of performing biopsies in clinical settings, serum ALT and AST have long been used as surrogate biomarkers of hepatocellular damage and liver function. There is also a large body of evidence, demonstrating that serum ALT and GGT are positively correlated with the liver fat content. All participants in our study received an interpretation of results of their laboratory tests and body composition assessment; however, they were not provided with advice on making changes. This might have contributed to the unexpected weight loss in the n-3 PUFA and control group and is a limitation of our study. To our knowledge, this is the first study examined effects of n-3 PUFA in an Iranian population with NAFLD. We selected the dose of supplement on the basis of a study by Qin et al. in an Asian population which mentioned earlier. Another limitation of the present study was that due to budget limitations and sanctions, we could not measure primary and changes in EPA and DHA content of erythrocyte, and this could have contributed to the negative results. However, compliance was carefully checked according to the study protocol. We suggest that future trials conduct this assessment. The current study shows that moderate weight loss, in contrast to n-3 PUFA, resulted in important changes in liver enzymes, anthropometric measurements, and cardiometabolic risk factors in overweight and obese patients with NAFLD. Patients who lost ≥4% of weight showed larger decreases in serum ALT, AST, and GGT levels, but no additional benefits to the lipid profile or insulin sensitivity were observed. 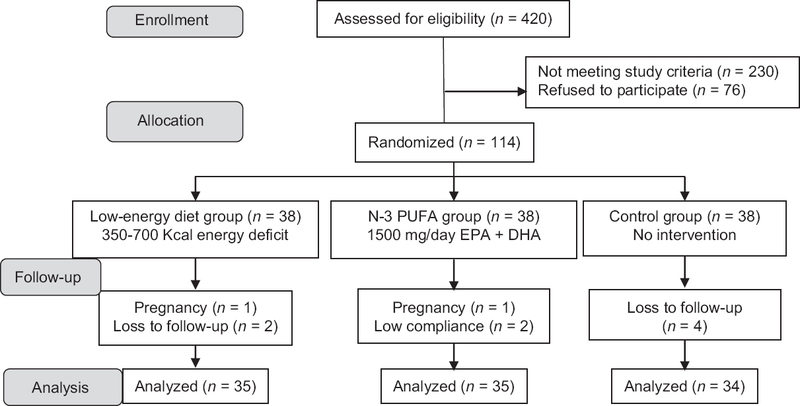 Finally, published data are too heterogeneous in terms of dosage and EPA/DHA ratio, treatment duration, population included, and outcome measurement to conclude whether n-3 PUFA supplementation is efficacious in the treatment of NAFLD or not. The existent protective effect of n-3 PUFAs on the incidence of CVD is a matter of debate in patients with NAFLD and is not probably mediated by improving cardiometabolic risk factors. This assumption deserves further investigations. This study was financially supported by Food and Beverages Safety Research Center, Urmia University of Medical Sciences, Urmia, Iran. Marchesini G, Bugianesi E, Forlani G, Cerrelli F, Lenzi M, Manini R, et al. Nonalcoholic fatty liver, steatohepatitis, and the metabolic syndrome. Hepatology 2003;37:917-23. Targher G, Day CP, Bonora E. Risk of cardiovascular disease in patients with nonalcoholic fatty liver disease. N Engl J Med 2010;363:1341-50. Chalasani N, Younossi Z, Lavine JE, Diehl AM, Brunt EM, Cusi K, et al. The diagnosis and management of non-alcoholic fatty liver disease: Practice guideline by the American Gastroenterological Association, American Association for the Study of Liver Diseases, and American College of Gastroenterology. Gastroenterology 2012;142:1592-609. Curioni CC, Lourenço PM. Long-term weight loss after diet and exercise: A systematic review. Int J Obes (Lond) 2005;29:1168-74. Kris-Etherton PM, Harris WS, Appel LJ, American Heart Association. Nutrition Committee. Fish consumption, fish oil, omega-3 fatty acids, and cardiovascular disease. Circulation 2002;106:2747-57. Araya J, Rodrigo R, Videla LA, Thielemann L, Orellana M, Pettinelli P, et al. Increase in long-chain polyunsaturated fatty acid n – 6/n – 3 ratio in relation to hepatic steatosis in patients with non-alcoholic fatty liver disease. Clin Sci (Lond) 2004;106:635-43. Cortez-Pinto H, Jesus L, Barros H, Lopes C, Moura MC, Camilo ME, et al. How different is the dietary pattern in non-alcoholic steatohepatitis patients? Clin Nutr 2006;25:816-23. Lu W, Li S, Li J, Wang J, Zhang R, Zhou Y, et al. Effects of omega-3 fatty acid in nonalcoholic fatty liver disease: A meta-analysis. Gastroenterol Res Pract 2016;2016:1459790. Parker HM, Johnson NA, Burdon CA, Cohn JS, O'Connor HT, George J, et al. Omega-3 supplementation and non-alcoholic fatty liver disease: A systematic review and meta-analysis. J Hepatol 2012;56:944-51. Buckley JD, Howe PR. Long-chain omega-3 polyunsaturated fatty acids may be beneficial for reducing obesity-a review. Nutrients 2010;2:1212-30. Promrat K, Kleiner DE, Niemeier HM, Jackvony E, Kearns M, Wands JR, et al. Randomized controlled trial testing the effects of weight loss on nonalcoholic steatohepatitis. Hepatology 2010;51:121-9. Oliveira CP, de Lima Sanches P, de Abreu-Silva EO, Marcadenti A. Nutrition and physical activity in nonalcoholic fatty liver disease. J Diabetes Res. 2015;501:793982. Warziski MT, Sereika SM, Styn MA, Music E, Burke LE. Changes in self-efficacy and dietary adherence: The impact on weight loss in the PREFER study. J Behav Med 2008;31:81-92. Qin Y, Zhou Y, Chen SH, Zhao XL, Ran L, Zeng XL, et al. Fish oil supplements lower serum lipids and glucose in correlation with a reduction in plasma fibroblast growth factor 21 and prostaglandin E2 in nonalcoholic fatty liver disease associated with hyperlipidemia: A randomized clinical trial. PLoS One 2015;10:e0133496. Mirmiran P, Esfahani FH, Mehrabi Y, Hedayati M, Azizi F. Reliability and relative validity of an FFQ for nutrients in the Tehran lipid and glucose study. Public Health Nutr 2010;13:654-62. Kelishadi R, Rabiee K, Khosravi A, Famori F, Sadeghi M, Roohafza H, et al. Assessment of Physical Activity of Adolescents in Isfahan. J Shahrekord Uni Med Sci 2001;3:27-33. Masterton GS, Plevris JN, Hayes PC. Review article: Omega-3 fatty acids – A promising novel therapy for non-alcoholic fatty liver disease. Aliment Pharmacol Ther 2010;31:679-92. Argo CK, Patrie JT, Lackner C, Henry TD, de Lange EE, Weltman AL, et al. Effects of n-3 fish oil on metabolic and histological parameters in NASH: A double-blind, randomized, placebo-controlled trial. J Hepatol 2015;62:190-7. Sanyal AJ, Abdelmalek MF, Suzuki A, Cummings OW, Chojkier M; EPE-A Study Group. No significant effects of ethyl-eicosapentanoic acid on histologic features of nonalcoholic steatohepatitis in a phase 2 trial. Gastroenterology 2014;147:377-840. Guo XF, Yang B, Tang J, Li D. Fatty acid and non-alcoholic fatty liver disease: Meta-analyses of case-control and randomized controlled trials. Clin Nutr 2018;37:113-22. Vilar-Gomez E, Martinez-Perez Y, Calzadilla-Bertot L, Torres-Gonzalez A, Gra-Oramas B, Gonzalez-Fabian L, et al. Weight loss through lifestyle modification significantly reduces features of nonalcoholic steatohepatitis. Gastroenterology 2015;149:367-78.e5. Okita M, Hayashi M, Sasagawa T, Takagi K, Suzuki K, Kinoyama S, et al. Effect of a moderately energy-restricted diet on obese patients with fatty liver. Nutrition 2001;17:542-7. Thomas EL, Brynes AE, Hamilton G, Patel N, Spong A, Goldin RD, et al. Effect of nutritional counselling on hepatic, muscle and adipose tissue fat content and distribution in non-alcoholic fatty liver disease. World J Gastroenterol 2006;12:5813-9. Dattilo AM, Kris-Etherton PM. Effects of weight reduction on blood lipids and lipoproteins: A meta-analysis. Am J Clin Nutr 1992;56:320-8. Ghouri N, Preiss D, Sattar N. Liver enzymes, nonalcoholic fatty liver disease, and incident cardiovascular disease: A narrative review and clinical perspective of prospective data. Hepatology 2010;52:1156-61. St George A, Bauman A, Johnston A, Farrell G, Chey T, George J, et al. Effect of a lifestyle intervention in patients with abnormal liver enzymes and metabolic risk factors. J Gastroenterol Hepatol 2009;24:399-407.